Ah, the joy of travel. Ah, the joy of travel. Seeing new places, trying new things, realizing you forgot to pack the charger for the device you need to use right this very second…. 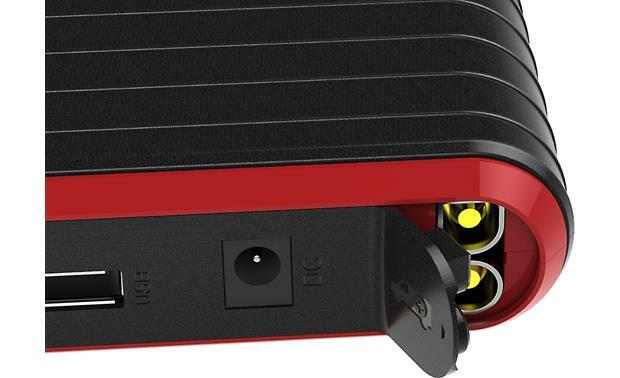 What you need is a powerful, portable power pack that can charge your smartphone, your tablet, your camera, your gaming system – and even start your car. What you need is a PowerAll PBJS12000-RD. 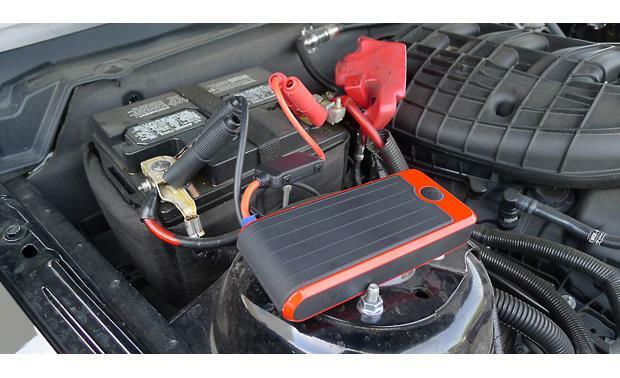 This compact charger has the juice to start the most important device for travelling – your car. A dead battery can ruin your whole day, but a fully charged PowerAll PBJS12000-RD can safely jump start your car (plus roughly 17 others, if necessary) and get you back on the road. Just plug the professional-grade 2.0 jumper cables (which offer a larger in-line fuse than ordinary cables) into the dedicated outlet, put the secure clamps on your battery, and crank the engine. 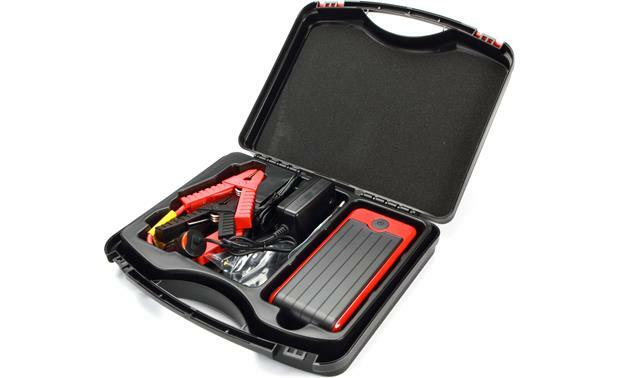 The PowerAll delivers more starting power than some purpose-built jump starters, but it's not as bulky, heavy, and hard to use. It also includes reverse polarity protection, so you're still safe if you accidentally mix up the red and black cables. The PowerAll Deluxe package has everything you need to travel with confidence. 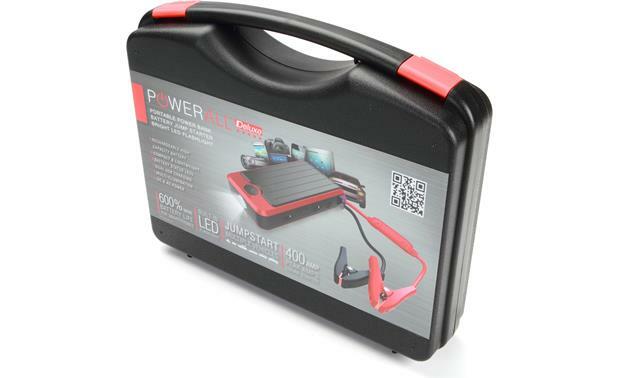 Your PowerAll PBJS12000-RD comes with a heavy-duty carrying case that also contains an assortment of adapter plugs, so you'll be able to charge a variety of electronic devices. This wide-ranging collection of iPhone, Sony/Ericsson, Samsung, LG, Nokia, PSP, micro USB and mini USB adapters lets you choose the ones you need and leave the rest at the house. 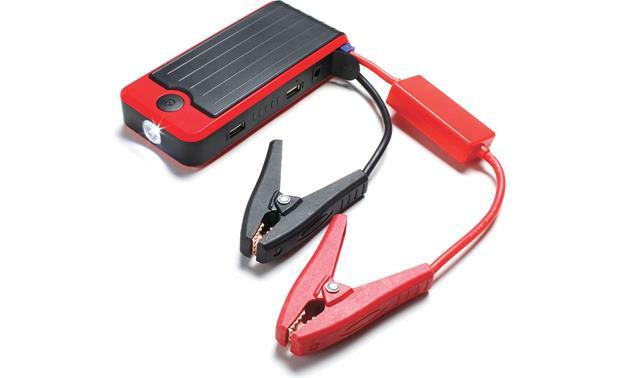 It also comes with a USB adapter cable, along with the AC/DC and 12-volt cables you'll need to keep the PowerAll fully charged at home or on the road. As if charging electronic devices and jump starting cars weren't enough, the PowerAll PBJS12000-RD also sports an integrated flash light. If you forget to change the batteries in your "car" flashlight (Which we all do from time to time...), it's good to know you have a backup that can be used as either a continuous torch light or as an emergency “SOS” flashing signal light. And with 3-6 months standby time, the PowerAll will be there when you need it. Excellent product. I have 2 vehicles,1 tractor,1 boat,1 zero turn mower so this will be needed a lot. Nice that it is so easy to carry and use. Ken asks is the unit itself waterproof? I know that the connections are not. I wouldn't use it underwater but I have used it in the rain/snow to jumpstart a car. I doubt it would be safe to jump your car or to charge your phone underwater though. 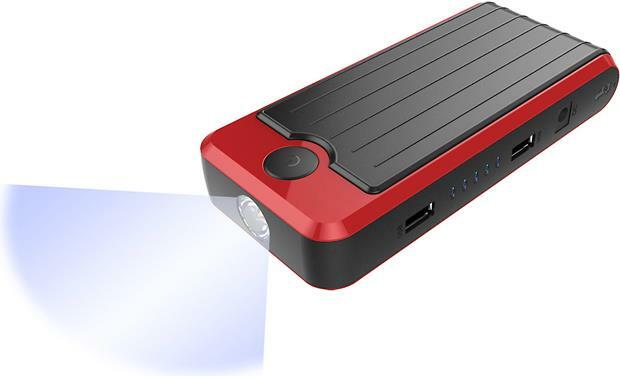 All-in-One PowerBank, Jump Start, and LED Flashlight: The PowerAll is a powerful compact and convenient "charge-everything" device that fits inside your pocket or glove compartment of your vehicle. Never worry about your smartphone or tablet running low on battery ever again. If your car won't start, you don't have to call a tow truck service for assistance. If you enjoy the outdoors you don't need to bring an additional flashlight. The PowerAll is the only thing you need to solve all of these problems. The PowerAll has a battery life of 500 cycles. Dual USB Charging Ports: A great travel companion that you can take with you on the go to charge all of your portable electronic devices, such as smartphones, tablets, cameras, camcorders, GPS unit, MP3 players, wireless headphones, and portable gaming systems. 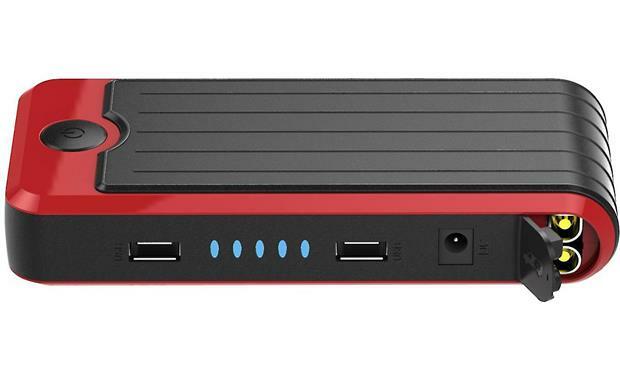 It's high-capacity 12,000 mAh Lithium battery is equipped with two 5V/2.1A USB (type-A) ports that can charge two separate devices fast and simultaneously. 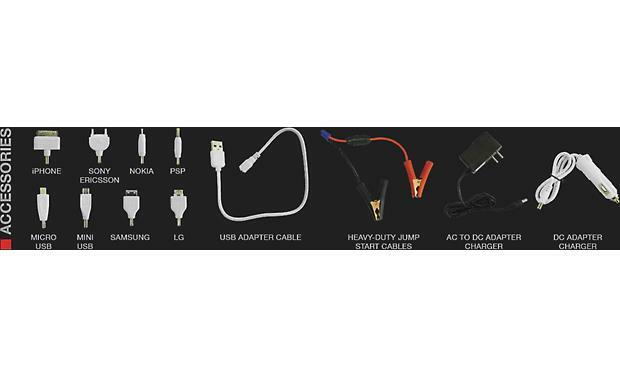 There is one main USB adapter cable with eight different adapter plugs that will fit most major portable electronic devices. On a full-charge, it can easily charge your smartphone up to 6-8x before ever needing to be recharged. Once devices are fully charged it will go into sleep mode to preserve the battery. Note: Disconnect the jumper cables from the battery or the PowerAll device immediately within 10 seconds after the vehicle engine has started to avoid accidental overheating and any possible damage to the PowerAll. LED Flashlight: Whether you're working under the hood, or outdoors camping you'll be glad to have this ultra-bright LED flashlight handy. It has two illumination modes; Constant On and SOS Signal Light for emergency help. If you're outdoors camping and find yourself in an emergency situation you can use the SOS signal light flash to attract attention. Once activated the SOS signal flash will stay on continuously for up to 120 hours on a full charge. It can put out 86 lumens of light power up to 300'. The LED flashlight has a lifespan of 100,000 hours. AC/DC Charging: The PowerAll comes with AC and DC chargers for when you need to recharge the PowerAll at home or on the road. There is an AC power adapter which plugs into a standard household AC wall outlet for charging in the home or office. There is also a 12-volt/cigarette lighter adapter for charging the PowerAll inside your vehicle. It takes 2-3 hours to fully charge the PowerAll. Safety & Protection: It has over current protection, short circuit protection, overload protection, over voltage protection, and over charge protection all built-in to ensure the safety of all your valuable devices and vehicles. Battery Capacity LED Indicator: The PowerAll provides five LED indictors which lets you check the remaining battery capacity. Note: While the PowerAll is being charged, the indicator lights will flash one by one until it's at maximum charge. All five indicator lights will stay on when the PowerAll is fully charged. Do you sell the chargers for the power all deluxe seperately? I need both as well as the cords that originally came with it. If so, how much are they? Thanks for your question. We would not have any original components in stock. We have a universal AC power adapter such as this: http://www.crutchfield.com/p_979ACD477/Hosa-Universal-Power-Adapter.html Otherwise you may want to reach out to the manufacturer which is Gryphon Mobile Electronics. Their customer service number is 8889038777. Hope that helps. How do you charge it? Does it come with a charger? What type of battery is this? Lithium-ion? Thanks for your question. Yes you are correct, it has a high-capacity 12,000 mAh Lithium battery. You can find this information on the details tab of the product page under features. Hope this helps. The jumper cable ends on mine both lost half of the metal clips and then when trying to jump an older Cadillac, the small red box melted inside causing one cable to come un-soldered. Are there individual parts for sale on this device? I need to replace just the jumper cable assy. Will it hold a charge when subject to below zero weather for 3-5 days? Mine has been in the trunk of my car all winter, we have had many days as cold as -16 and it still holds a charge. We live in Minnesota, many -25 below days. So far, we haven't had a problem. The Power All is one of the BEST investments we've ever made!!!! We even started my Dodge Durango, complete dead battery, in a storage garage, and it started right up! My husband thanks me EVERY day for purchasing the Power All!!!! Can one leave the powerall on a charger continuously without harming the product? Does it have an automatic shut off? Thanks for your question. 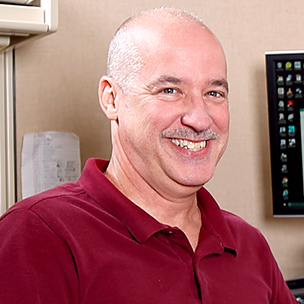 I would recommend reaching out to an Advisor by phone or online chat. They will be able to check into this for you. How long will it hold a charge? For example, if I charge it full, and it sits in my trunk for a few months, will it hold the charge to work when I need it? 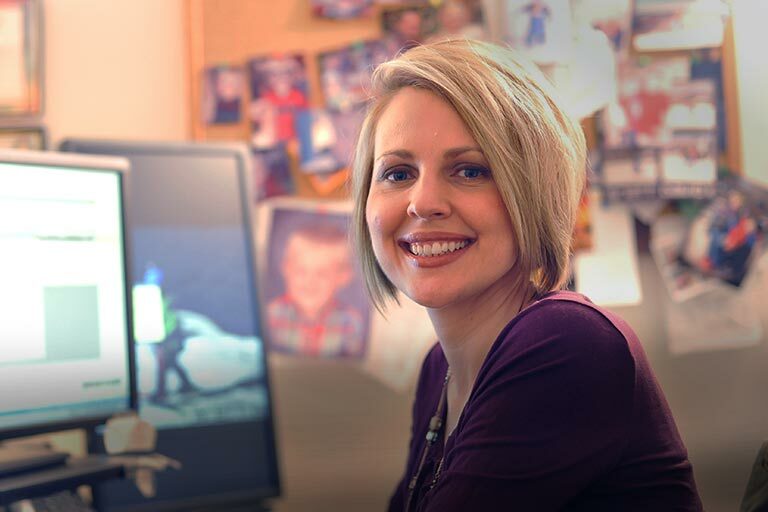 With 3-6 months standby time, the PowerAll will be there when you need it.